The air conditioner is finally turned off for the season so its time to get serious with the indoor gadens again. 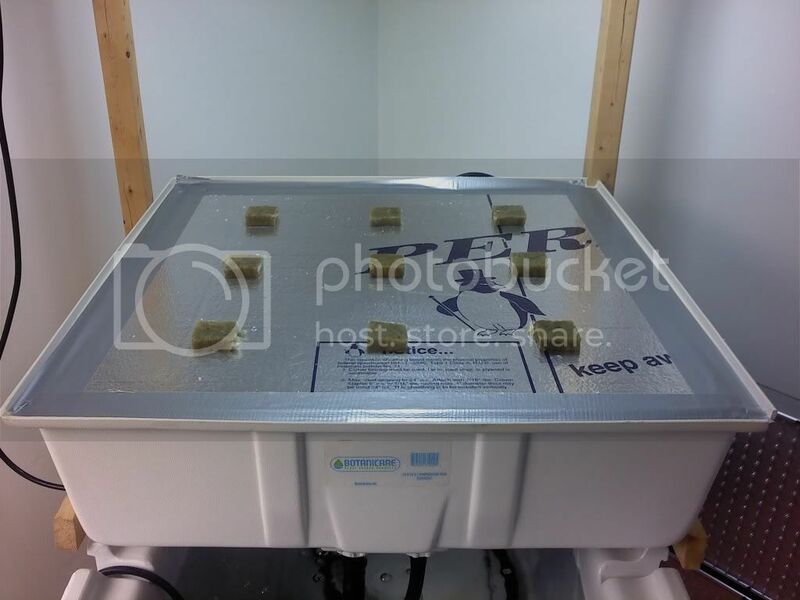 I never shut down completely this summer but I did do some major renovations to the grow room. Some might look at what we had last winter and what we have now as going backwards but to us its much more user friendly and accomodates what we grow much better. The first thing to notice is the hydroton is gone! Washing those darn rocks was the one part of the process that was a major PITA! All systems for now are RDWC. There's a couple of root crops i want to try again and I'm thinking they will do better in hydroton than they did with RDWC. The HID lighting, gone! 3 of the 4 systems are T5 and the other one is a mogul based CFL at 125Watts. The CFL will be replaced with a T5 system sometime soon as it just does not have the coverage needed for a 2x2 tray. Acutally the 600 is the one thats gone, I kept the 400, maybe, some day I'll bring it back out. The grow tents, gone! These really are gone. Sold the set on Ebay along with a bunch of other hydro stuff I didn't need or didn't use. Grow tents are fine and dandy devices for running light (timed light) sensitive plants or when your running major wattage but for T5's there really isn't a benefit. 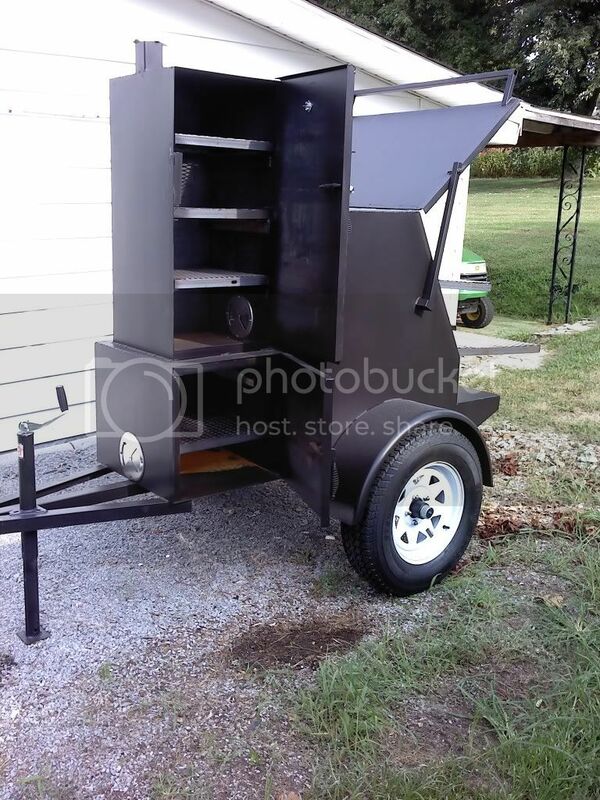 It's an offset wood fired meat smoker. Just did a church dinner the other weekend for 100 folks. Smoked chicken in the big chamber, smoked baked beans in the small chamber (above the firebox) and of course I made a salad from the hydro lettuce. Done a few salads before and the folks just can't get over the taste of fresh lettuce. Growing enough to feed a 100 people is another story but will get to that. The center of our hydro room is the 2' x 4' RDWC. 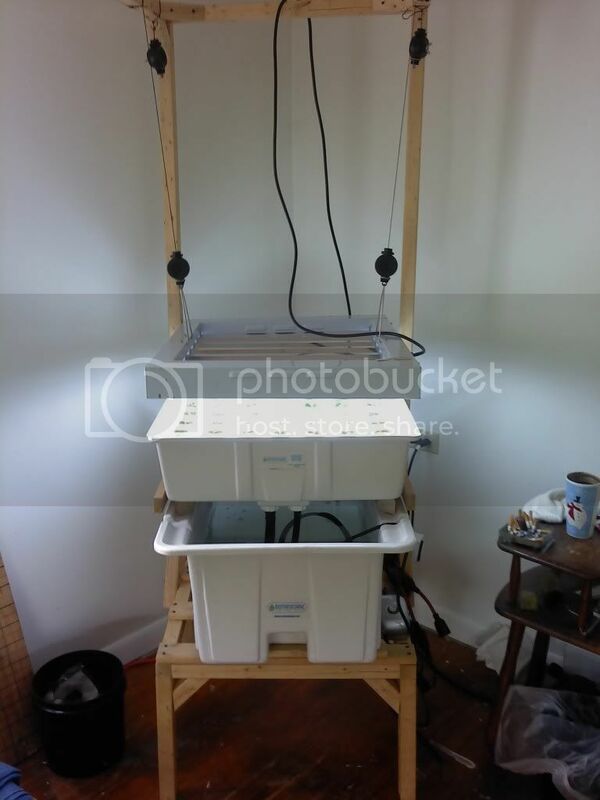 The flood tray holds about 15 gallons of water and the resv. holds over 40 gallons. The raft is 1" thick styrofoam board sold in 4x8 sheets at Lowes. I've swithced over to a-ok starter plugs from Grodan basically because of price. They are the best low cost cubes I've found. Nutrients for all my systems are still from Technaflora, the BC line of nutrients. Boost and Grow are the only ones I use from this line for leaf crops. Trial and error has proven that you've got to do every thing you can to keep light out of the resv and flood trays. Ugly yes but effect I've found duct tape to be great and sealing around the raft. You wouldn't believe the growth of algae from this small area. 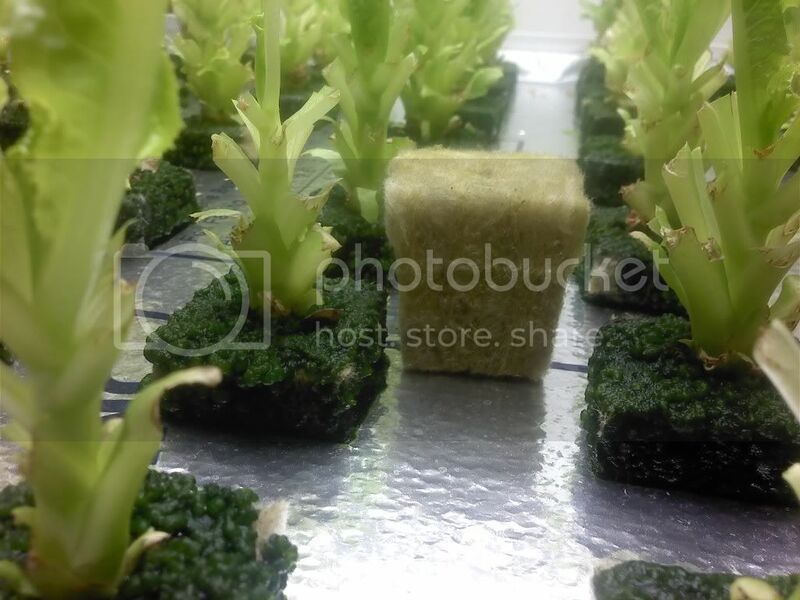 Granted the rockwool cubes are completely covered in algae but this algae has not effect on the resv or how the plants grow. The system is lit by a 4' 12 bulb T5 fixture from Quantum. It's called the "BadBoy" and it truely is that. The most powerful flourescent fixture I've ever seen. 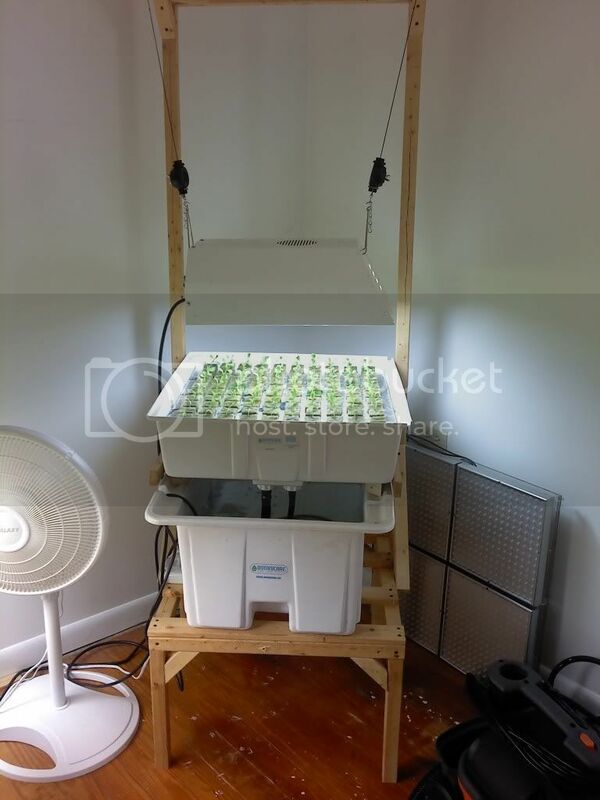 12 bulbs pulling a total of 760 watts puts out some serious light spread evenly over the tray. Granted this unit has the draw backs of producing a good deal of heat while making the electric meter spin much like the HID's did but the even coverage from one end of the tray to the other makes it worth while. This is the system that can feed 100 people as I mentioned in the first post. 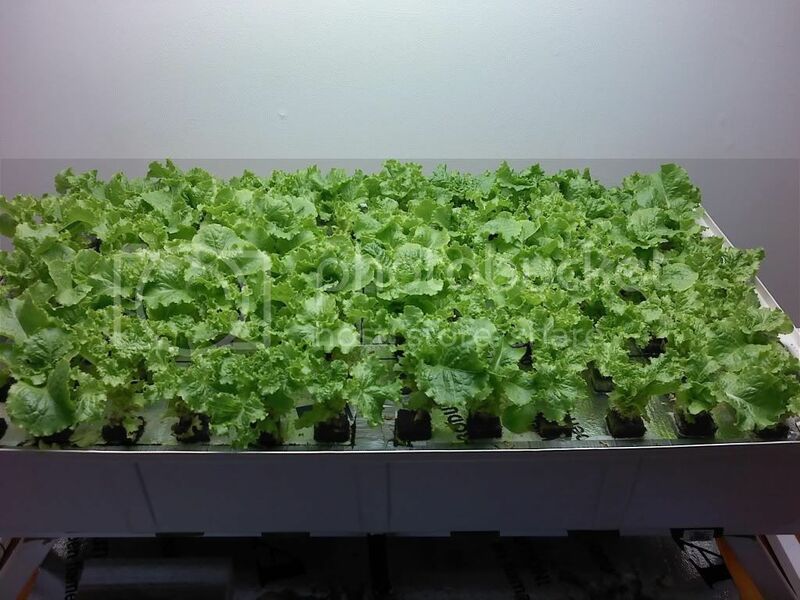 It yields 4 gallons of leaf lettuce every 4 days. 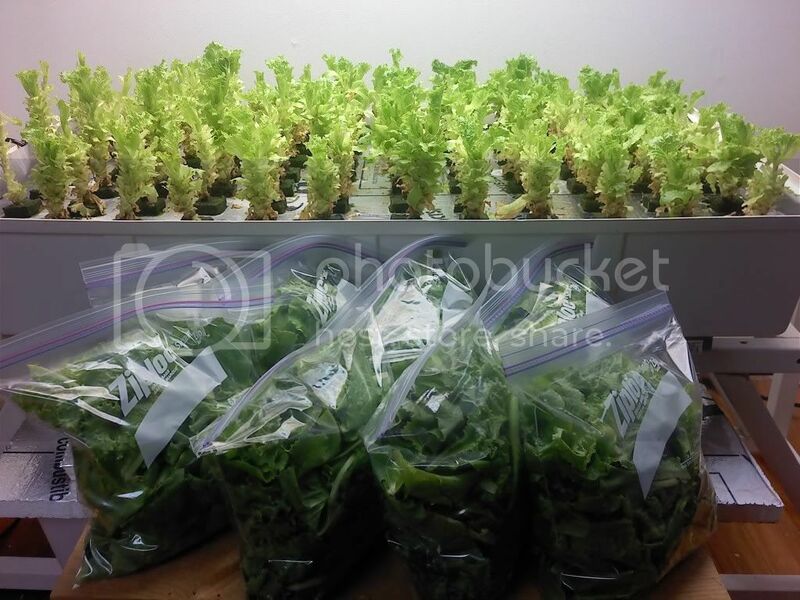 I harvest on Tuesday then again on Saturday, keep it stored in zip lock bags and there's plenty of lettuce to feed a big crowd. There's 2 air pumps feeding (4) 6" airstones to supply oxygen to the roots. This is an area I need to weak a bit, probably pumping too much air for the volumne of water in the flood tray. Water pump for this system is a small 130 gph that is restricted down to half the flow rate. Pump runs all the time so there is ample exchange between the resv. and tray. The 3 remaining systems are completely interchangable. 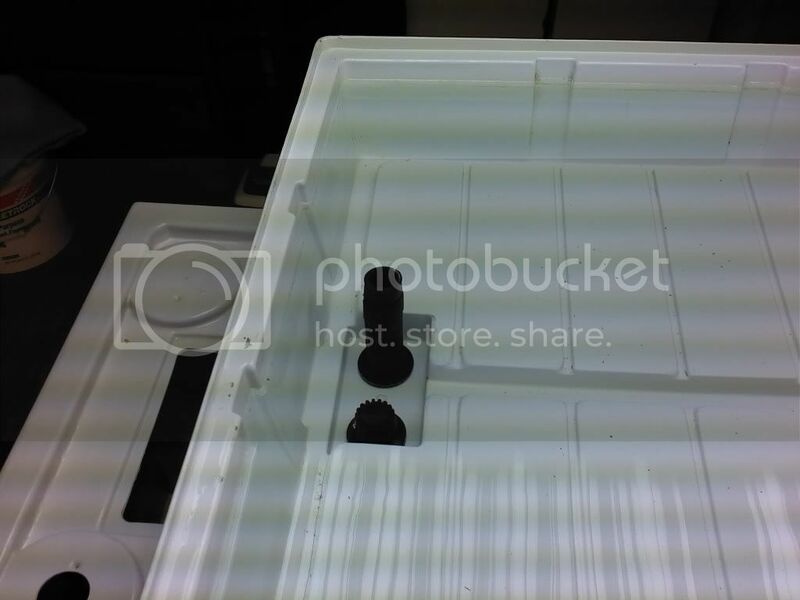 Flood tray's are identical and the resv.s are all within 5 gallons of being identical. For lack of a better term I'll call this system #2. It's purpose is to supply seedlings for the big system. The raft I have in it currently has room for 100 plugs. 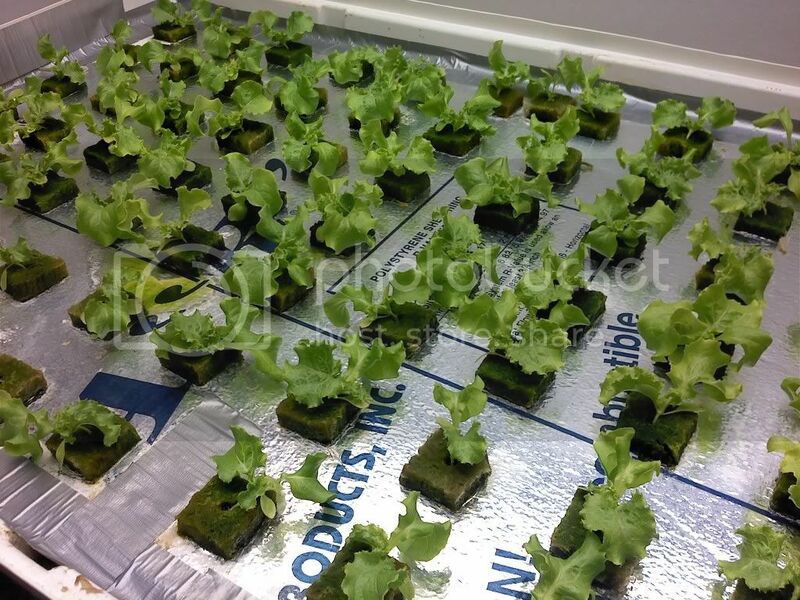 The big raft holds 85 so there is room for low germination rates. The reason I start the plants here and then transplant is to cut down on the 21 day down time if I planted directly in the big tray. The picture of this system has the 125CFL hung above it but I just got through replacing it with an 8 bulb T5 unit. You can see in pictures how the plant growth is beginning to get really uneven. 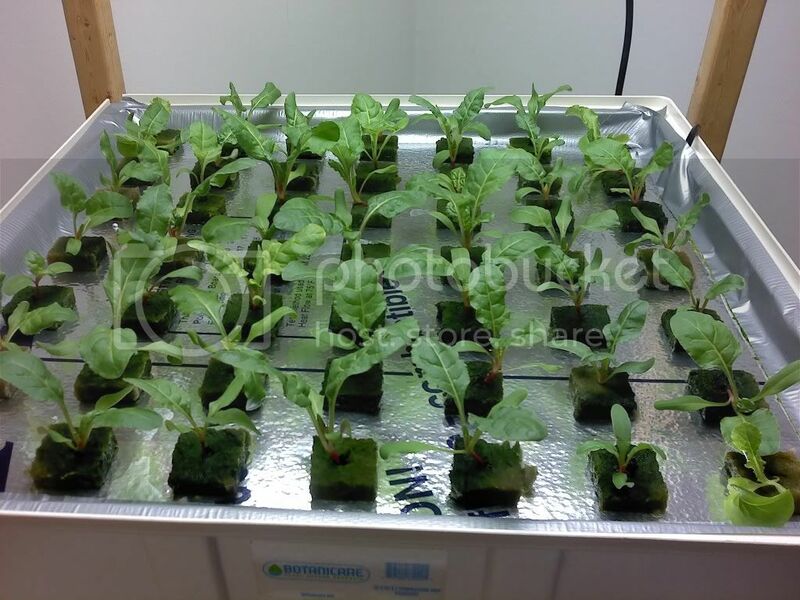 This fixture is fine for one or 2 plants in a 1 x 1 area but far from adequate for a 2 x 2 tray. 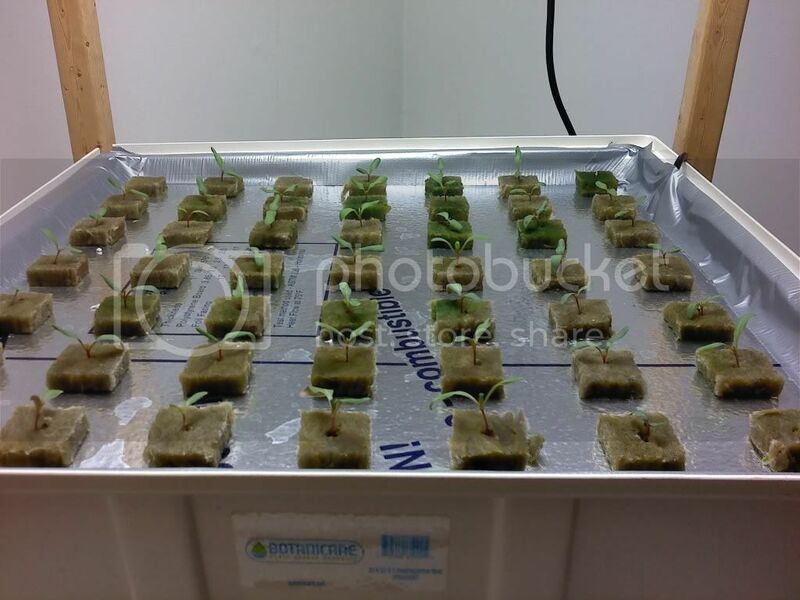 Since this system is only growing seedlings for about 14 days I didn't install and air pump or stones. The water pump runs 24/7 just like all the other systems. Systems #3 and #4 are my research trays. They are 2 x 2 flood trays as well, same size resv. Same lights and are currently fitted with 49 plug floats. This is basically the same plug spacing I use in the big tray. Since both of these systems are desinged for taking plants to harvest they each have an air pump and stone. I've also sealed the edges to cut down on algae growth. Started these at different times but in the same manner. Pure water for the first seven days and then add in nutrients to bring the ppm upto around 200. I'll increase as the pplants mature. 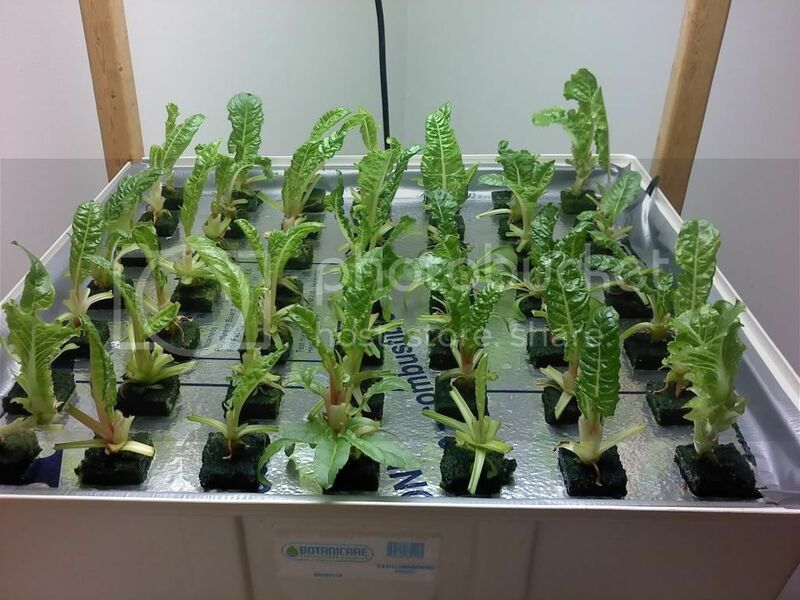 The lettuce is upto 450ppm while the swiss chard is still young enough its holding at 200. 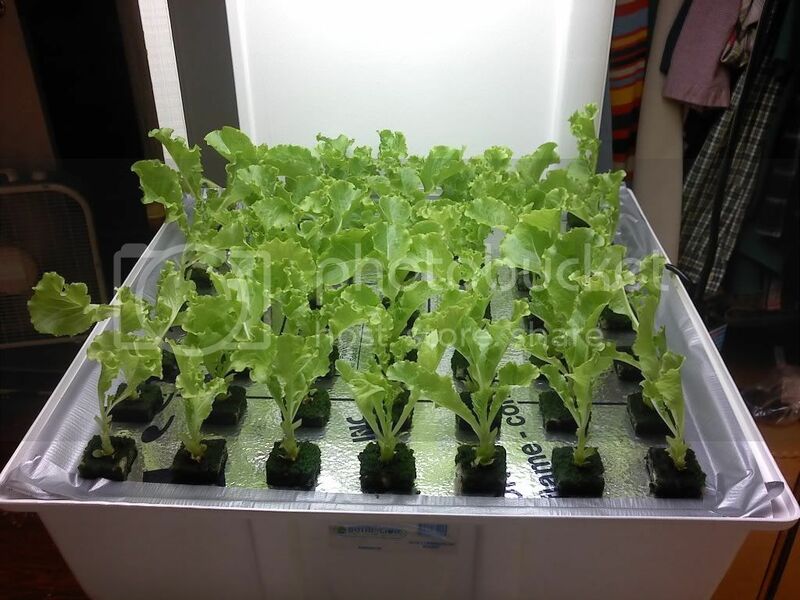 These trays are both lit by a Hydrofarm 8 bulb T5 unit. The one above the swiss chard went over to the lettuce seedlings until this weekend when that system gets replanted. All T5's are not created equal. These units from Hydrofarm do not even come close to producing what the Quantum does. Harvest is further apart and the stalk has a longer internodal length which tells me the plants are searching for light. They do a good job but they just arent the Quantum. So in the latter systems do the cubes remain saturated all the time? If they do, they have problems with mold or algae on top? TCHarris32 wrote: So in the latter systems do the cubes remain saturated all the time? If they do, they have problems with mold or algae on top? All 4 of these systems are built on the same principle of RDWC (re-circulating deep water culture).. They all are comprised of a top flood tray and a bottom resv. They all have the same float material (insulation styrofoam board). 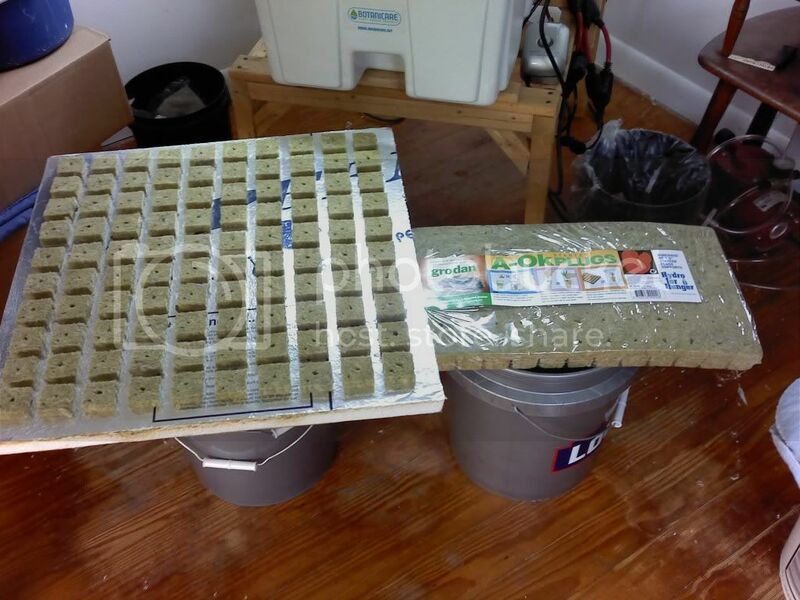 And lastly the all have the same rockwool cubes. The differences are the lights all though they are all flourescent. There is 2 types of algae that grow in these systems. One is in the water and the other is on the cube itself. After many grows I could care less about the algae on the cubes. Covered in algae woulod be an understatement when talking about the rockwool on mature plants in these systems. It does nothing to hinder the growth or productivity of the plants. On the other hand, algae in the water is a whole different story. Trick is to keep light out of the water. Simple really. Light and water in these conditions and algae will begin to form in less than 2 weeks and left uncontrolled will do some serious damage to the plants robbing them of oxygen and nutrients and it can get to the point of covering the roots and blocking all exchange of water nutrients and oxygen. So, I could care less about the algae on the cubes, but I take very serious the algae growing in the resv. Cool. 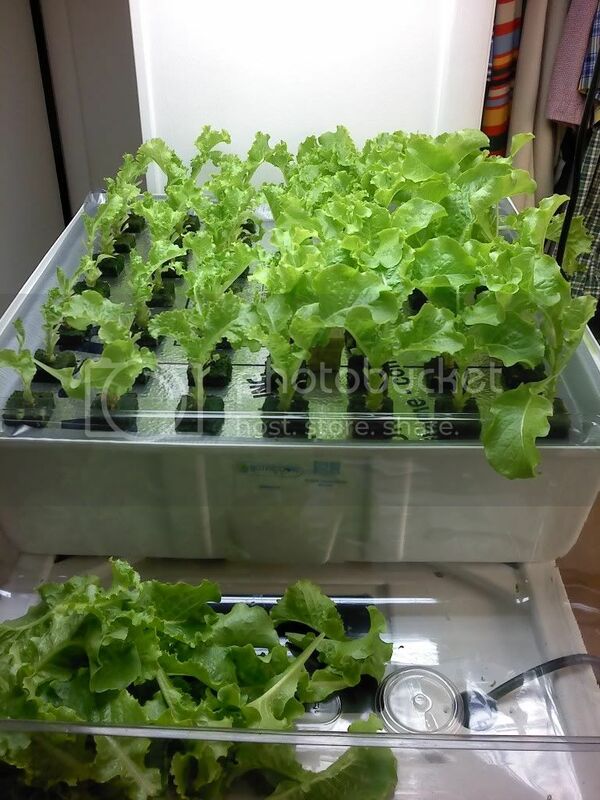 I have been battling a little bit of algae in my DWC system so I understand that. I was curious about the rockwool as I'm new to the hydro and haven't used it. Thanks. TCHarris32 wrote: Cool. I have been battling a little bit of algae in my DWC system so I understand that. I was curious about the rockwool as I'm new to the hydro and haven't used it. Thanks. I'm a huge fan of rockwool. Tried other mediums for seed starting and have gone back to RW. 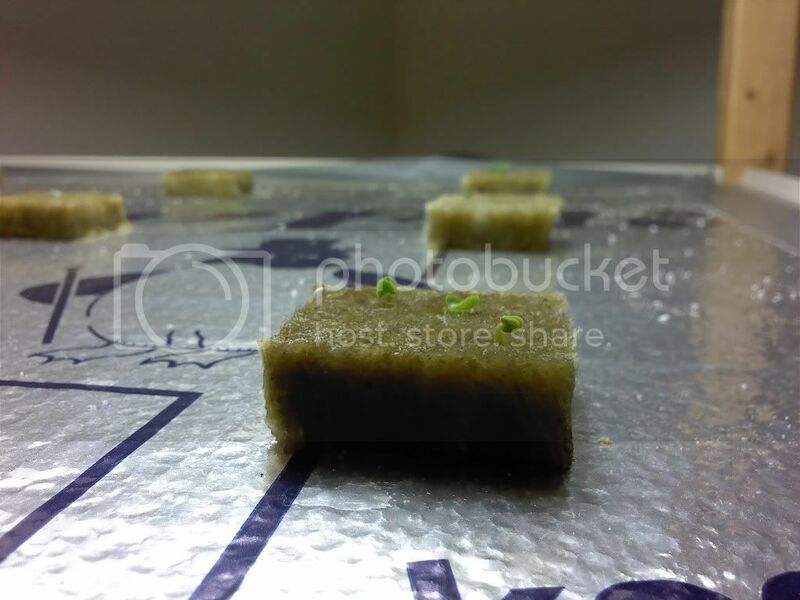 Theres many methods of hydroponics but you've got to start with either a seed or a clone and rockwool does great for either. Up until this last year I had grown mainly with flood/drain systems but I still used RW for starts. They were placed in pots and covered with hydroton after the plants grew. Keeping the top layer of hydroton dry prevented any algae from forming so it was never really an issue until I switched over to RDWC. Now algae is part of it, granted I could use the covers for the cubes like they sell for the bigger blocks but to me it just isn't worth the hassle. I can live with the algae as long as it doesn't get into the water. 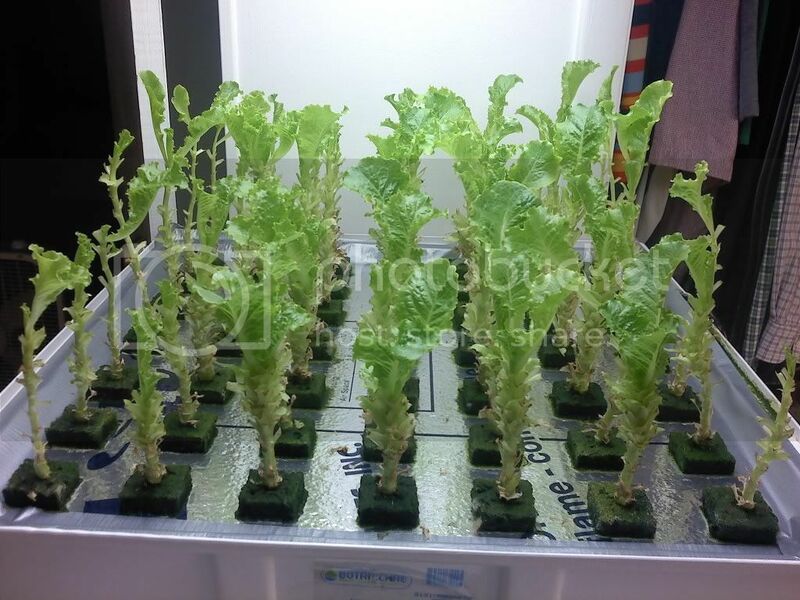 Here's a shot of some lettuce in one of the systems. Cubes are completely covered. The cube I placed there is what they all looked like when the seeds were planted. This algae has no effect on how the plant grows. All activities of the plant happen above the RW or below the raft in the water. I see you are still fully involved in the hydro systems. Good work! Sage Hermit wrote: I see you are still fully involved in the hydro systems. Good work! Howdy Sage, nice to hear from you again. Hydro is in my blood I guess. One system or another (or many LOL) have been running non-stop year round. I had an out door garden and enjoyed it, even planted a fall garden with cool season veggies. Funny thing is that I'll produce more and better quality from the spare room in my house. Mother nature has made it real difficult to grow a garden in these parts for 2 years now with out owning stock in the city water company. Maybe I need to go to raised beds some day. 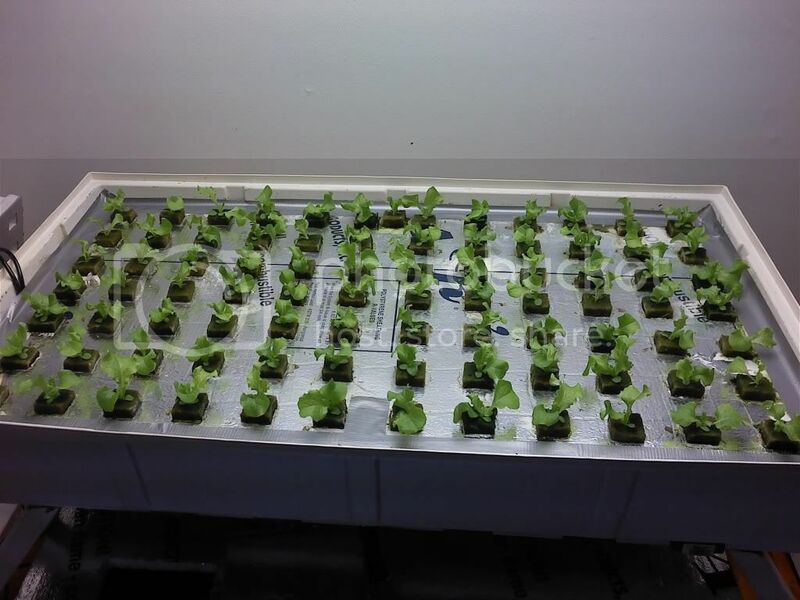 these leaf lettuce seedlings are 15 days from planted, transplanted to the large tray at day 11 and they are beginning to take shape. Little to much stretch in the seedling tray but they'll recover soon. The Swiss Chard I don't really have a clue what it's supposed to look like but they have nice color and shape so I am guessing they are doing ok. The small leaf lettuce tray is doing well. It just doesn't produce like the larger tray under the Quantum but it keep s the greens flowing during the change over. Well it's been about a month so time for an update. Showing pics of harvest every 4 days gets a little old. Yep, the large system harvests every 4 days. 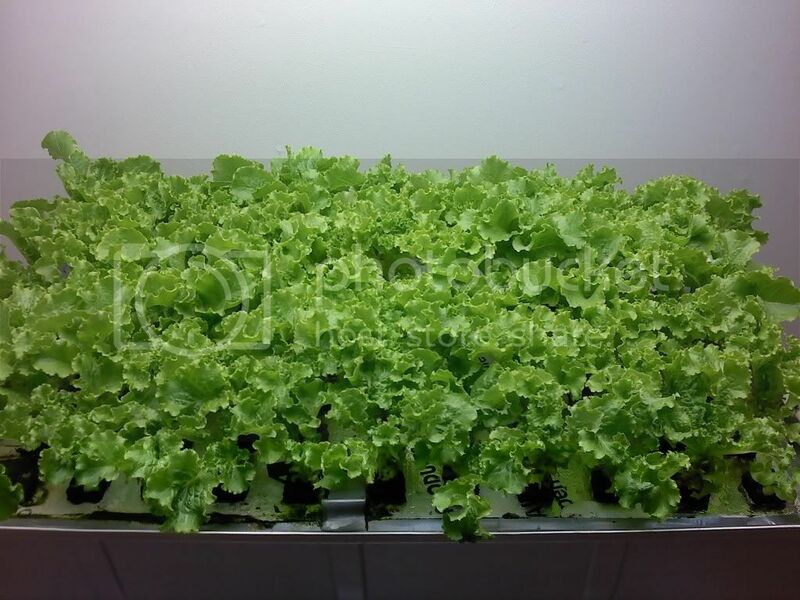 The small flood tray of lettuce doesn't quite keep up and the only difference is the light. Both T5 but thats where the similarities end. The Quantum is just one serious light system, can't believe the difference myself. Here's the large tray, probably about 1/2 way through its 60 day cycle at this point. Plants were harvested 2 days ago and coming back nicely. Yeild is a consistant 4 gal. each time. 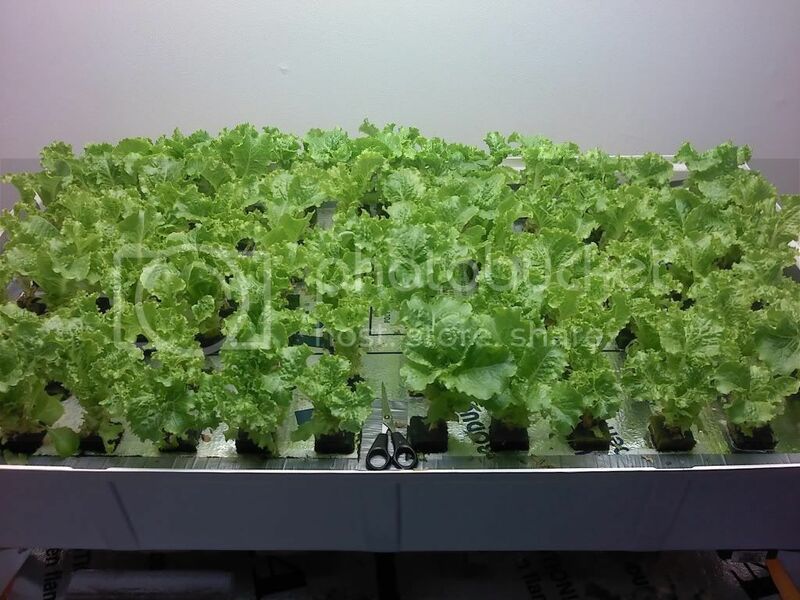 The small lettuce system has about run its course. Will be cleaning out the system here in the next few days. 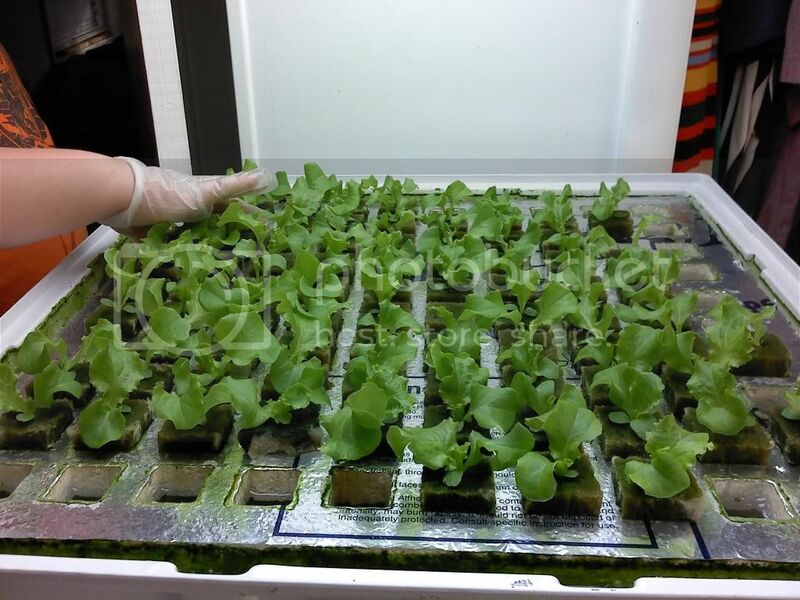 The light is going over to another system and this tray will be the starter tray for the next cycle of lettuce in the first tray shown. The Swiss Chard has turned out to be a pleasant surprise. Learned the trick is to cut it when the leaves are smaller. Growth is as quick or close to it as the lettuce. Been told the taste is very sweet but never personally tried any of it. Plants shown here were cut 2 days ago. Trying another batch of Basil. 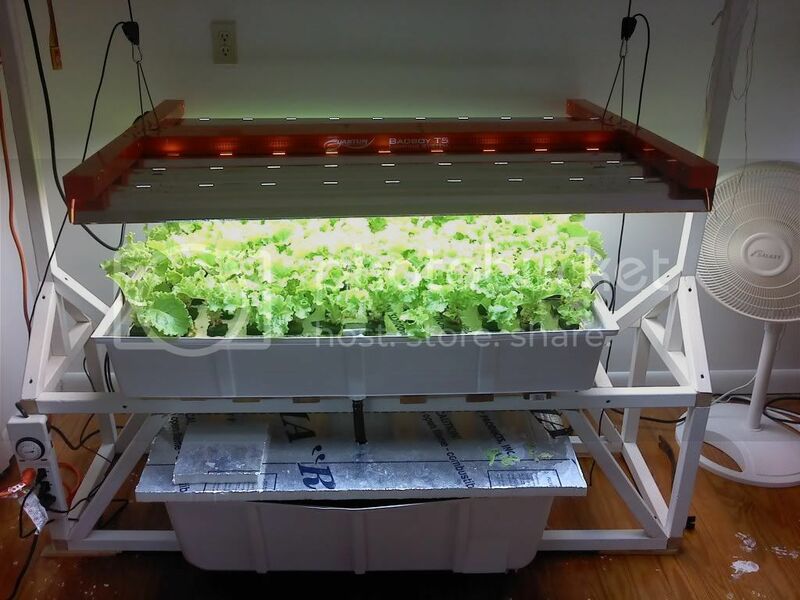 Did some last fall but had it planted too thick with other herbs so this system is set up for only 9 plants in a 2x2 tray. Will be fun to watch it grow. Planted this morning so not much to see yet. Designing a small hydro system for my son's science project this winter, makes it all worth the time and effort when we do it together. 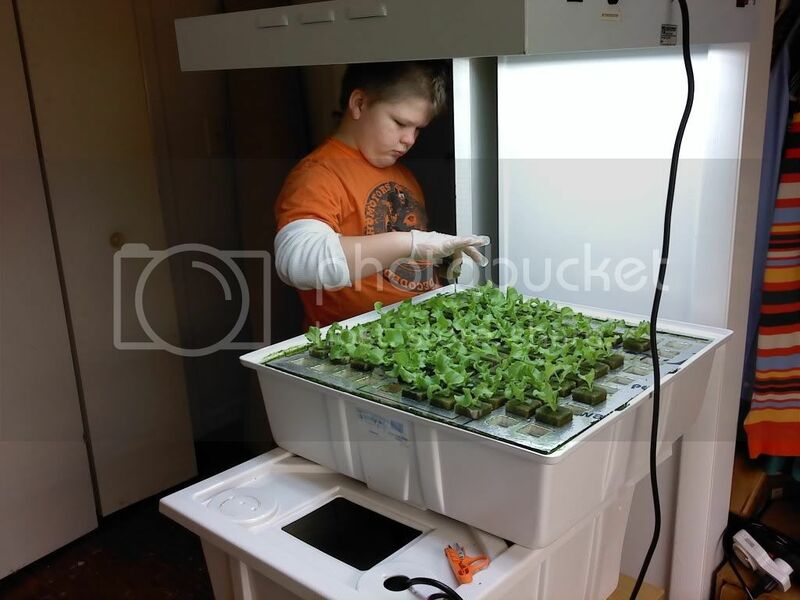 Little Man was over for the weekend and we spent some time in the grow room. Granted I had to compete with the laptop and tv but we did manage to get a few things accomplished. Mainly planted the next crop of leaf lettuce. I had emptied this system and cleaned it a few days ago so that fun part was out of the way. 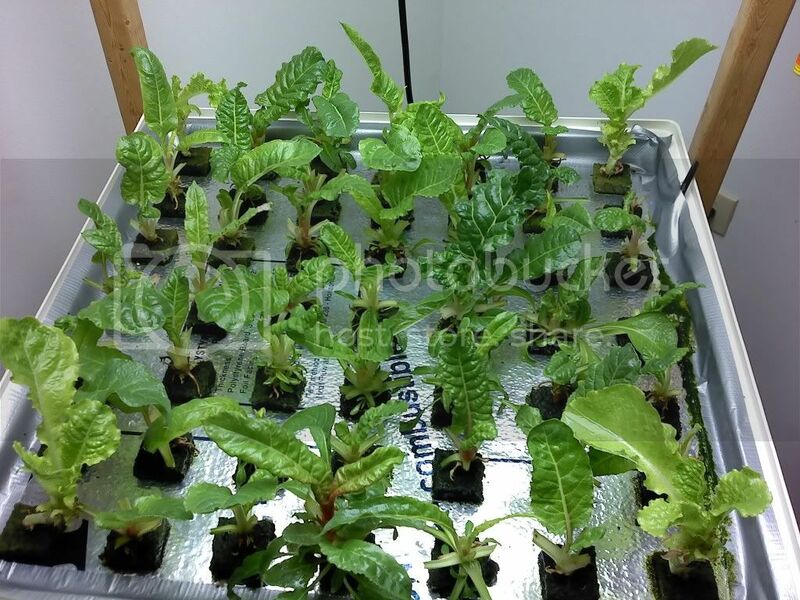 The rockwool we use comes in many shapes and sizes, what I've found to be the most cost effective for growing lettuce is the A OK starter cubes from Grodan. Cubes come in a sheet of 98. These aren't individually wraped like the other cubes so you have to take a knife and cut the slab apart, rockwool cuts like warm butter and is one part of the project my 9yo helper likes to do. 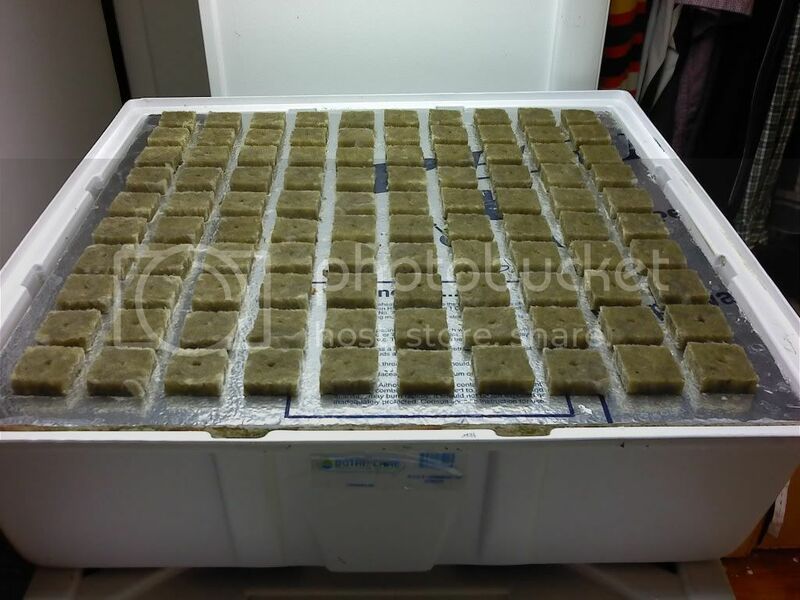 Here's a shot of the cubes as they are shipped to us along with the float thats already been planted. Here's the tray flooded and ready for the float. Nothing in it but tap water at this point, nutrients aren't added until germination is complete. The short black screen is the fill line, taller black pipe is the over flow. Pump runs constantly so the top tray is all ways full and recirculating back into the resv. Sit the float in the tray and the seeds are officialy planted. 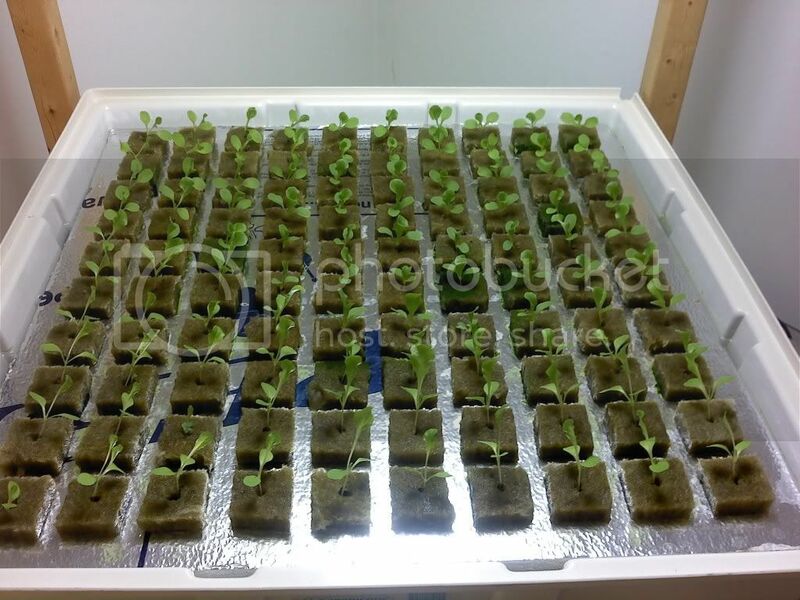 Germination takes 3-5 days with lettuce. Ths Swiss Chard is coming to an end I'm thinking. First time to grow it so I really don't know but the plants are starting to sucker out instead of producing top leaves. Problem with this grow is the darn nats. Never been this bad with any lettuce crop and everything is exactly the same. Thinking since more light hits the float that may be whats encouraging the gnats to reproduce. Aggrivating little creatures but do no harm to the plants. The Basil has finally germinated. I've got spoiled at the speed of lettuce but these are coming along nicely. The large tray as been very productive this cycle but has started to slow down already. Cycle is usally 60 days but we're gonna wrap this one up around 50. The new crop will be ready to transplant in a couple weeks, will update the grow then. Thanksgiving was a bountiful harvest here in the grow room, much to be thankful for in life in general! We were going down to mom's to visit with family so we harvested the large tray one last time. Granted I could have stuff the bags but we just filled each of the 8 gallon zip locks so there was plenty to send home with folks after the big meal. The system sat idle until this morning when my helper was over for the weekend and we cleaned it up. We don't completely clean the entire system between each batch and this was one of those times. 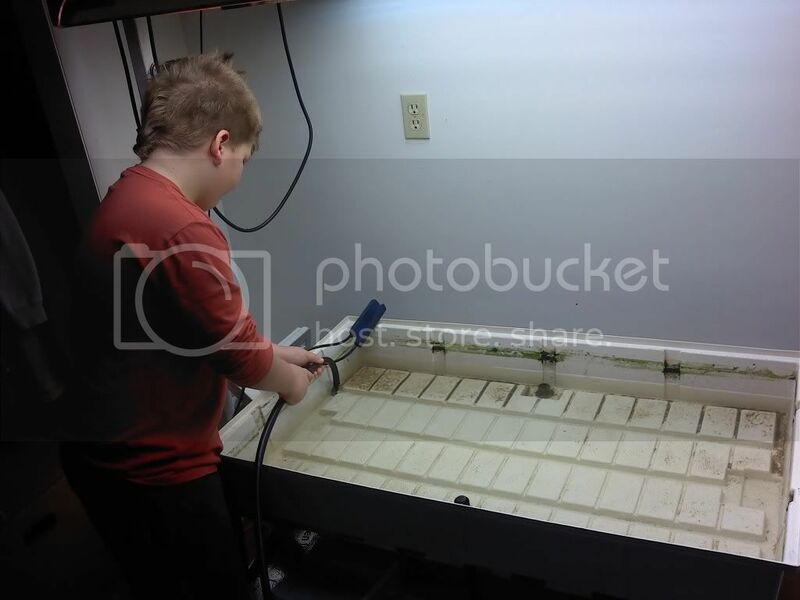 We do get the roots out of the top tray and with the help of a syphoning hose we clean what we can. Look close and you can see just how much gravity will help clean out a tray. There's pumps laying all over the grow room but there are times syphoning just does a better job. 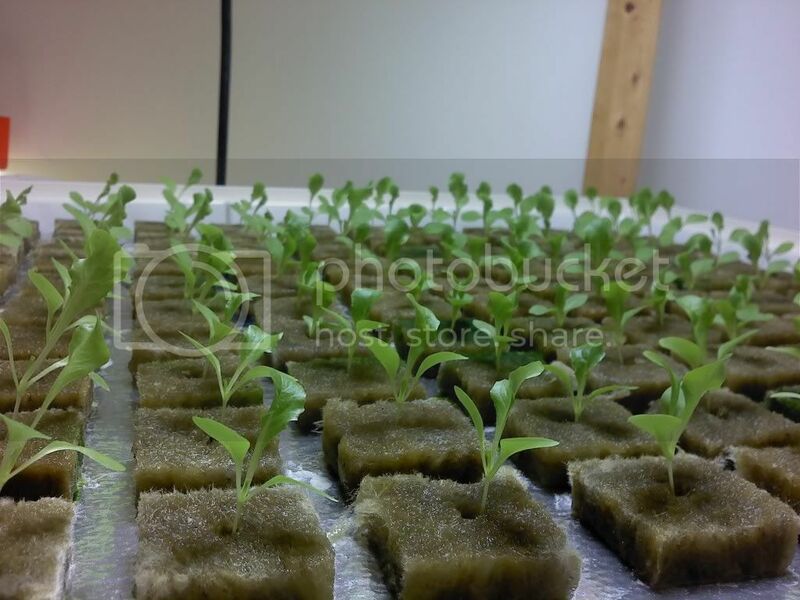 The new seedlings are 13 days old now and plenty ready to be transplanted. 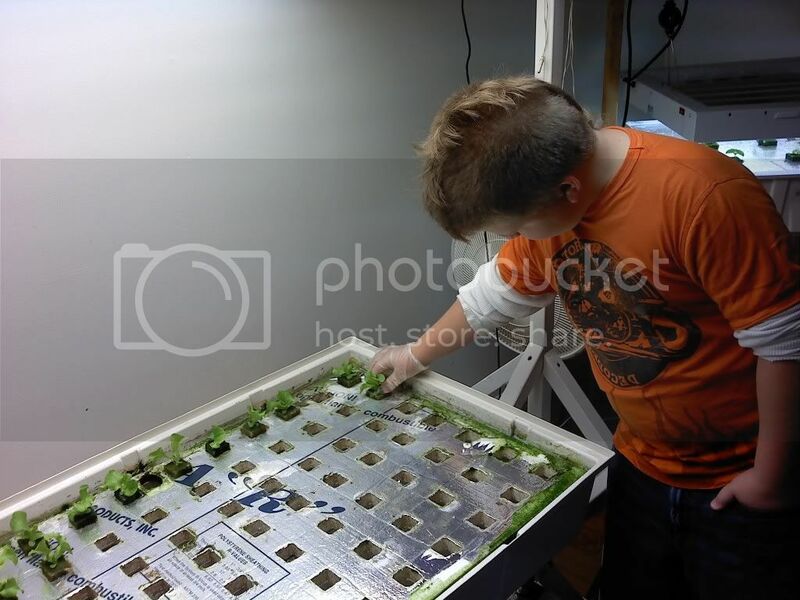 There's 100 seedlings to choose from for the 85 holes in the large tray. Little man was a big help getting the system back up and running. Give these plants about 7-8 more days and we will be takeing the first of many cuttings from them. 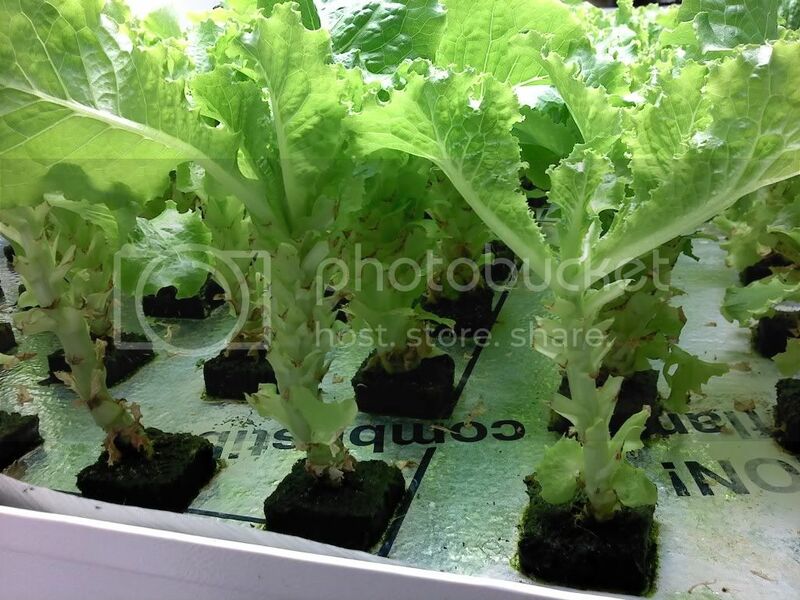 Gotta love how fast leaf lettuce grows! Very nice and informative. I have questions. Do you have production costs? Cost per pound harvested? Cubes - seed - electricity- nutrients. Traditional grown salad mix here, sells for $6.00 per bag. About $12.00 per pound. First off thanks for stopping by the thread, much respect for your outdoor gardening efforts. The only costs I've ever thought about was the electricity. It runs about $35 a month with all systems running. I'm now completely flourescent, 3 of the 4 systems are T5's. Heat is a byproduct of the light system and will increase electrical use in the summer months. Most T5's don't put off much heat but the Quantum runs at about 650 watts and puts off heat comparable to an HID system. Best I can figure a crop of lettuce will use about $40. The seeds I use come from Burpee where I picked up 3500 for $8 + shipping so maybe $12 total. I'll plant 300 per crop to insure a full system so that's about $1 per crop. Nutrients aren't as bad as some folks think. I use a basic 2 part product from Technaflora. $85 for the 2 gallons of nutes which will last about a year so I figure about $7 per crop. Float material is re-useable to a point this is the 4th crop with this float and will be replaced. Brings the costs of it to about $1 per crop aswell. The starter cubes are $.10 each so that's $10 per crop. 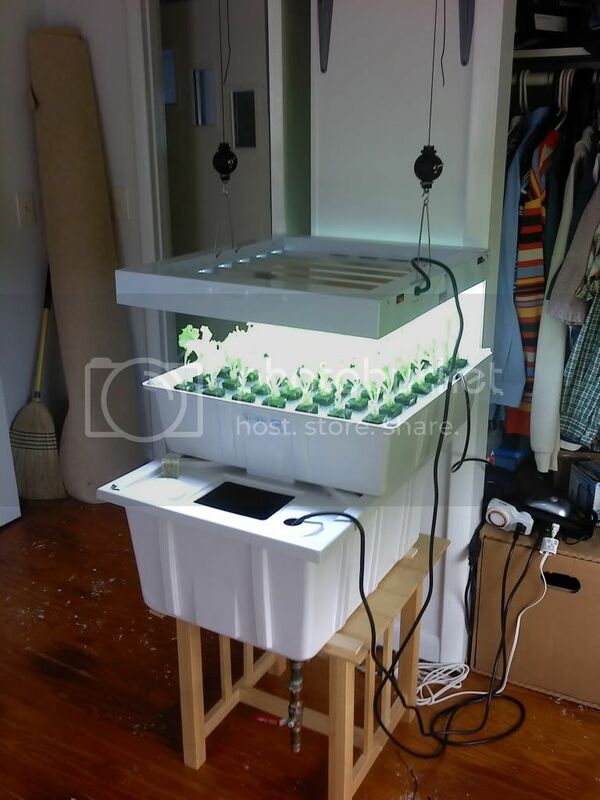 There's all ways other plants growing in the room but if I try and break the costs out for the lettuce alone it runs about $59 per crop. Yeild is steady at 50 gallons of fresh leaves per crop. Guess that makes the costs of production come in around $1.10 per gallon. This figure doesn't include the "capital" costs, just what it takes to operate the system. I don't weigh the lettuce but I'm more than confident there's more than 1 lb in each bag.